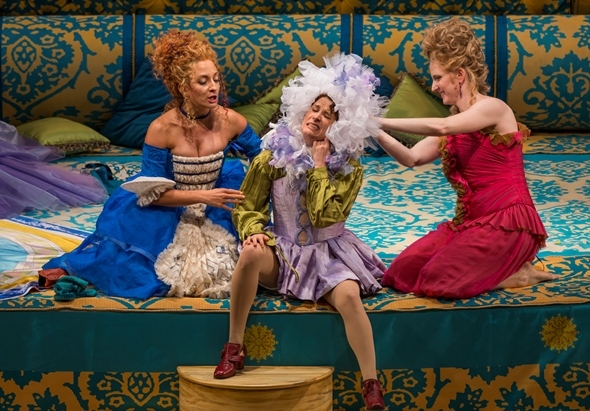 If Mozart’s “The Marriage of Figaro” is inherently and effectively a bittersweet comedy that edges into farce, the new production directed by Barbara Gaines that opens the Lyric Opera of Chicago season reframes it as farce that edges into cartoon. Musically, this “Figaro,” conducted by the Hungarian Henrik Nánási in his American debut, fares best where Gaines’ sometimes overwrought concept intrudes least – where a uniformly strong cast of singers is allowed to stop cavorting long enough to stand and deliver Mozart’s witty, touching, brilliant and wise arias and ensemble numbers. The singers’ fortunes seemed to vary in direct relation to how hard Gaines was trying to infuse the opera with either energy or originality. 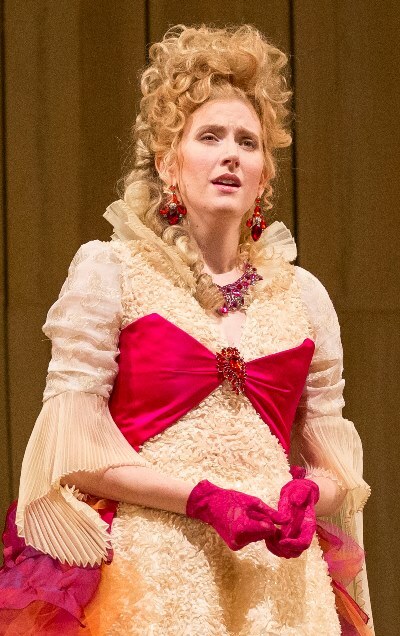 How infinitely more successful was Majeski’s calm, poignant turn through the Countess’ Act III rumination “Dove sono” as the singer was allowed to trust everything to Mozart – and, not incidentally, to Nánási, a knowing and empathic conductor who always showed the onstage voices to best advantage. That said, it’s also true that the Lyric Orchestra offered a rather lackluster account of Mozart’s scintillating Overture under Nánási, though by the second act, the entire production had clicked and never faltered further. Like everyone else, Plachetka showed his better vocal colors – a grand-scaled sound, flexible and expressive – as the ensemble settled down. Two principal singers appeared unaffected by either Gaines’ directorial hijinks or first-night nerves: Soprano Christiane Karg’s bubbly, agile-voiced Susanna and bass-baritone Luca Pisaroni’s vocally splendid and comically game Count came out of the gate dramatically focused and musically precise. 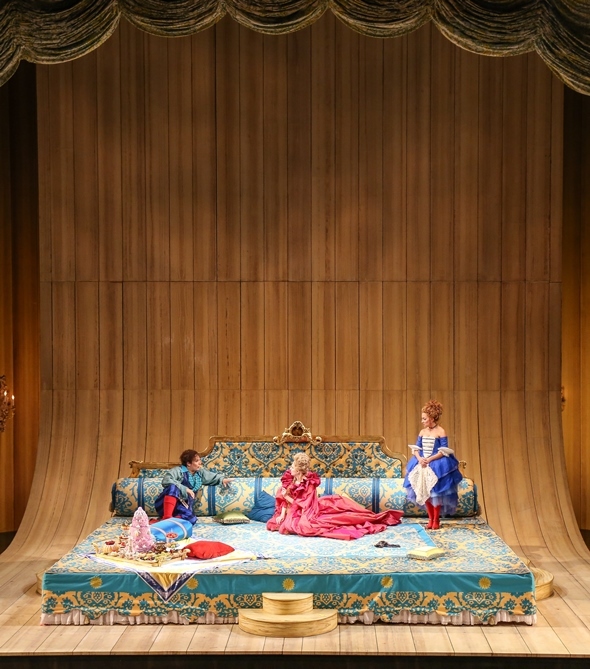 What must be said for Gaines’ rambunctious production is that it heartily embraces “The Marriage of Figaro” at its essence as a model ensemble opera. Once past the perhaps temporary issues of Act I, it’s great fun and, I must also say, pointedly engaged with the spirit of Mozart’s sublime music. Karg and Pisaroni have riotous fun in the duet of Susanna’s faux flirtation with the randy Count. Everybody — not least mezzo-soprano Katharine Goeldner as the aging Marcellina and bass Brindley Sherratt as gruff old Dr. Bartolo — gets into the craziness of the revelation of Figaro’s true birthright. 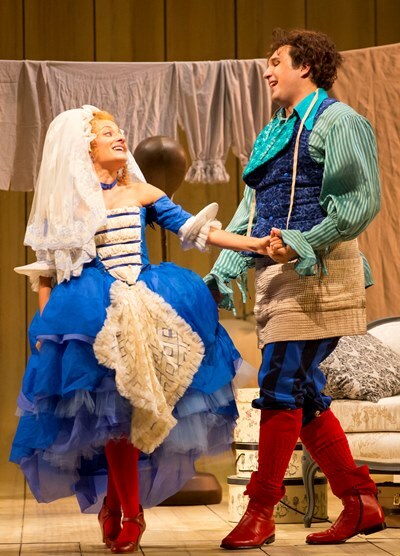 To the credit of the creative team, Gaines’ cartoonish concept is faithfully carried out in James Noone’s brightly hued sets and in flamboyant costumes by Susan Mickey that invoke commedia dell’arte. The ultimate reward of any opera – even Wagner’s, notwithstanding his notion of Gesamtkunstwerk, or fully integrated art work – resides in the music as dramatic locus, and depends on the mastery of those who bring it to life. In this “Figaro,” the Lyric boasts a fine collection of singers who know their way around Mozart and plunge full-tilt into the mirth as well as the pathos of music unsurpassed in its sheer magnificence.